We are Sabrina, Elisabeth, Ruth, Carmen, Ana, Jan, Nina, Marina and Daniela. 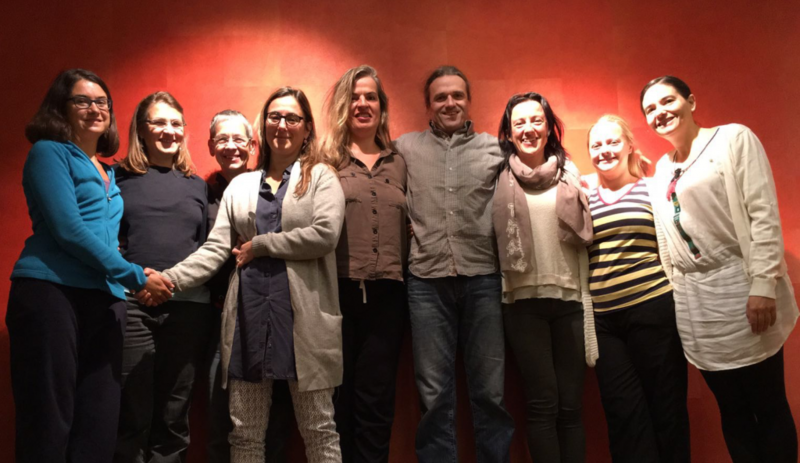 On the weekend of Oct 15-16, 2016 we created the first Art of Loving workshop experience together in Geneva. This is how it was for us. Your comment will be published within 24 hours after spamcheck. I really enjoyed the workshop and am glad I attended. The best part for me was to realize the importance of always connecting with myself first and being aware of my boundaries and the boundaries of those around me. Eli: I came to the workshop in Geneva because I am inspired by Nina’s and Jan’s teaching activity. What I like about their leading of the group is: their sensitive, top-level professional responses to the group members’ comments. Their sovereign handling of group dynamics. The didactically harmonious sequences between body awareness exercises and physical movement, group work and theory imputs. The pleasant group size. Nina and Jan showed themselves authentically. What are the most valuable experiences that we took with us from the workshop? – The wonderful, harmonious entry into the theme through Nina’s selection of the little Prince’s story and her supportive guidance and transfer of the topic into the physical experience: How she guided us into the real experience of how we encounter and “tame” someone. – Jan’s guidance into a deepened experience and localization of the Hara/our center in the body. I could feel in a refined way valuable, careful meeting is always possible when I am grounded in my center – when I perceive myself respectfully and appreciably. Ruth: Nina’s pair exercise to explore the love facets: Even after more than 20 years of living as a couple and walking our path together, Eli and I observed that our playgrounds are still expandable and still contain wonderful secrets. It is a gift to be together on this spiritual path. Eli: Even if I mentally knew some things about my mixed feelings about touch for a long time, really experiencing them was very valuable for me: When I experienced my feelings in the body, things could change fundamentally: joyful touch! Another highlight: Jan’s clear and simple explanation of the four dimensions of human being. What we would like to say: Nina, Jan – thank you very much for your light-hearted and weighty commitment during the two days. I came to the workshop to deepen my love, the love for my dreams and wishes and the love for situations and people, which are not so easy for me, like at my working place or with people who I am jealous of or who I find exhausting. What I did gain from the workshop: I felt a deep connection with others while feeling/being myself -> good to know, that I can do it and great that we practised it so much. To hear again that everything is ok – just acknowledge the feeling and breath into it – was empowering. It was eye-opening for me to experience that you can be full/nourished just from connection/love and that it can be good to let you feel your hunger and let you guide by it. I learned that it is possible to have a deep connection and receive love from maybe anyone and how important it is for me to center myself. I love it to see through my heart and to connect with others in a playful way. In the workshop I felt as I was in a safe space, supported by loving people and it was great to have the opportunity to play with & exercise connecting with others and experience my boundaries and the boundaries of the others. I really gained from the sharing & experiences of the others too. To sum it up, it is a workshop about love and the art of connecting, where you can start to learn to be in connection with yourself and at the same time with the other person in a beautiful and safe space and where you are also able to learn from others.